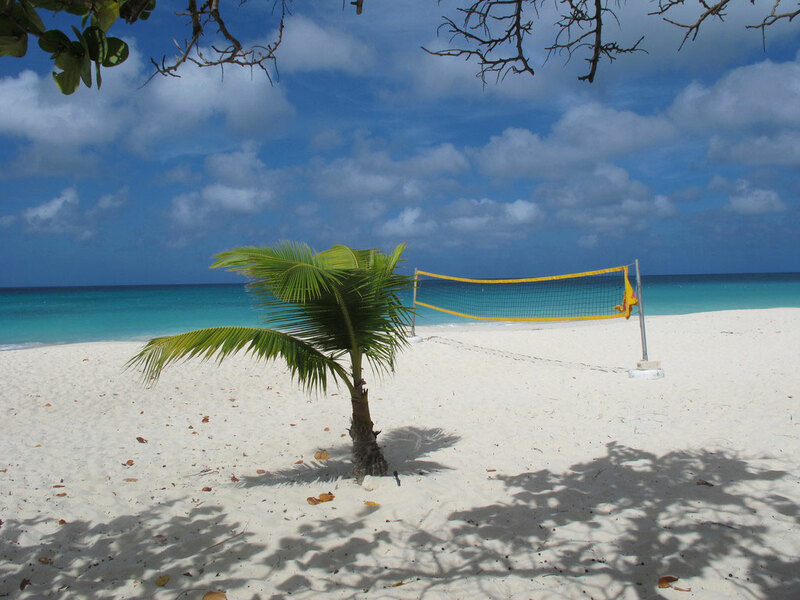 The location was at Manchebo Beach in Aruba. The "Take It!" came from the near perfection of the combination of the white sand beach, the palm tree in the foreground, the colors in the water, the blueness of the sky matched up with the white clouds, the shade shadows under which I was standing, the yellow bordered volleyball net, and last but not least the absence of any people. The whole thing looked as if it was staged for us to look at and have nothing distract us from making this one of those burned in memories. Having this photo of it makes it that much easier to remember. I must also admit that I felt that I was getting the banner photo for the web site a full two seasons in advance. The After Take: This is truly a photo that takes one back to memories of when the actual shot was taken. The weather was cold where I had come from and here it was, bathing suit warm, with constant breezes to insure that no one got overly hot. The water was also just the right temperature for swimming. The school year was in full swing back in the States so there were very few children there to enjoy all that was offered. This made the whole thing very different than all but a very few of my previous daytime beach experiences. There is just something about the squeals of delight given by children enjoying the water and especially when it is served up with gentle surf that adds emphasis to the pleasure of being there. I guess one could call all of the sounds combined as a sort of beach symphony. Some day I hope to return to this not so far away island at the same time of the year and take a longer time to relax and fully soak up more of what this great place has to offer. Here is hoping that we are enjoying this kind of weather back in the US; that everyone is making certain to be taking some time to get out into it. If being out there can include a beach that is great, however summer outdoor memories are made in many settings each with its own charm made vivid by how much we invest in savoring every moment. Thanks for joining us for the current photo presentation. You are cordially invited to return Friday, August 14th for a new picture that we hope you will enjoy. I'd love so much to be there during winter/spring. Ill take that over snow any day.